It's library music time again! Finally got my hot little hands on the first of a new set of commercial releases from the famed De Wolfe music library. De Wolfe, along with KPM and Bruton, are one of the mainstays of British library music. De Wolfe's music, with a library of over 80,000 tracks, has been used in thousands of productions including Monty Python, Emmanuelle, Dawn of the Dead, Brokeback Mountain, American Gangster and Doctor Who. Famous theme tunes include Van de Valk and Roobarb and Custard. 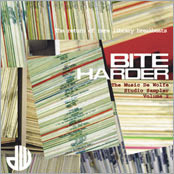 For their first commercial compilation release, Bite Harder, (a sequel to the Bite Hard sampler issued nearly a decade ago) Joel Martin and Warren De Wolfe have selected a stunning group of tracks for De Wolfe that runs the gamut of heavy psychedelic funk wig-outs to bizarre prog rock synth atmospherics. It's a vivid, bold collection, many of which I've never heard before but also containing a number of familiar old favourites such as Nick Ingman's 'Down Home' and Keith Papworth's 'Hair Raiser'. Other tracks have featured on other compilations such as 'Sound Book' and 'Music De Wolfe Volume 1' so they may be more familiar to other listeners. Peter Reno's 'Street Girl' starts us off. Taken from the 'More Electric Banana' album, I believe one of three recorded for De Wolfe by The Electric Banana, this is actually 60s psychedelic rockers The Pretty Things incognito. It's a furious bit of psych-funk-rock from 1968. This is followed by the frothy, flutey 'Gloaming', from '72, that weaves and spirals its infectious flute line into your brain. The title cut 'Who's Gonna Buy?' from The Lemondips album keeps up the funky pace with a great scratchy, jazzy, bluesy guitar. Quintessential listening follows with four absolute class acts as far as library tracks are concerned - Nick Ingman's 'Down Home' from his legendary 'The Big Beat' album, Barry Stoller's 'Funky Spider', Alan Parker's 'Crater' and the return of Reno with 'Silver Thrust'. Great slabs of poppy funk, with fat brassy stabs (the brass on 'Down Home' and 'Funky Spider' is utterly fantastic), wah wah guitars, stomping piano lines, organ riffs and spiralling flutes to the fore. Like the music of 'The Sweeney' or 'Bullitt'? This is for you. Simon Haseley's 'Precinct' takes us into the middle of the collection. It's a track from the equally legendary 'Hogan, The Hawk and Dirty John Crown' album of '72. It throws a killer set of strings into the mix of tom-toms, pounding bass, flute and percussion and is perhaps the ultimate in the crime-funk of the period with its little inflections of 'Shaft' like brass and flute. The barrage of drums, tom-toms, heavy bass and percussion of 'Hair Raiser' follows from Keith Papworth. The wah-wah guitars skate acrobatically along the surface of this thunderous track with its mid-break of tumbling drums. For me, Reg Tilsley's 'Warlock' is one of the stand out tracks. As it's from the 'Tisley Orchestral' album then you sort of know what you're in for. Fantastic strings, big, bold brass and drums and an escalating melody line supplemented by flute and guitars. A scrumptious piano and brass riff is just the icing on the cake. And it builds and builds by adding further string sections, drums, brass and guitar. It is gangster funk par excellence and reminiscent of Francis Monkman's title music for 'The Long Good Friday'. Off for a quick walk down a beach in the Caribbean with Johnny Hawksworth's steel drum sweetner 'Sandy Beach' and then into Jack Trombey's 'Underlay No. 3', all tom toms and piano and then some pizzicato harp doodlings. Lovely, cool jazzy piano on that counterpointing the harps. Haseley's back for 'Hammerhead' which is a storming piece of brass and string magnificence with harp stabs, cool flute, guitar licks and a beautiful melody line that blooms into a great drum, brass and string freak-out. Immensely impressive. It's very Bondian too so if you like your John Barry then you will love this. From the 'Great Day' album of '72. What a good year. For the final half dozen tracks, we enter a whole different world. Simon Park's 'Motives 1' will please all you Dario Argento fans as this sounds like a Goblin track off either 'Suspiria' or 'Tenebrae'. Lullaby atonal electronics over a driving rock pulse that gathers into a swirling crescendo. Not suitable for those of a nervous disposition. Equally freakish is the electro stylings of 'Flashpoint' with its giddy electronics and handclap percussion over bass riffs. Its sleazy and unearthly. If musique concrete is your thang then you'll be pleased to hear the brass and electronic tones of Pierre Arvay on 'Skyway' and for a change of pace you've also got Reno's 'Renegade' from the notorious 'Afro Rock' album (not the KPM one, I hasten to add), great response and call brass figures and a twangy guitar line feature heavily with a great sax break. The closers are Simon Park's 'Ooze' and John Saunders 'Myriad' which take us into a spacey feel. 'Ooze' is slow and smooth, cool jazz with a rolling organ and synth line. Very atmospheric. Saunders track is the least conventional of the collection and sounds like Tangerine Dream but then goes all down and dirty with a rocky guitar and drum combo interspersed with buzzy electronics. Divine. This is an essential compilation.